The first prize winner will become part of the professional ensemble at the Hessisches Staatstheater in Wiesbaden from August 2008 until July 2009. One (1) month work experience at the Opera House from early June 2008 to gain an insight into the procedures prior to the official start. The second prize winner will receive $3000. The third prize winner will receive $2000. The fourth prize winner will receive $1000. 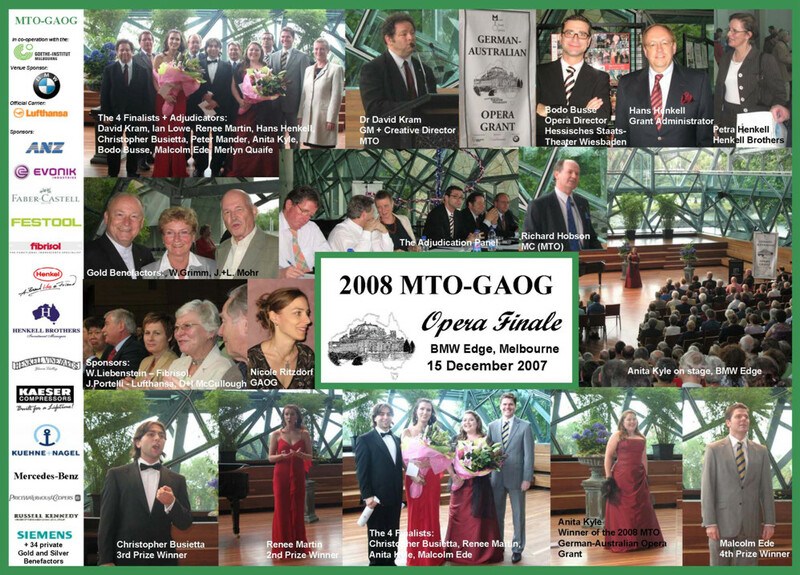 The Semi-Finals will be held on 14 December 2007 at Melba Hall, Melbourne University. 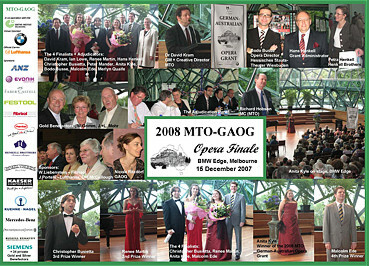 Finals Concert on 15 December 2007, 3.00pm at BMW Edge, Federation Square. More Than Opera Ltd represented by Mr. Stephen Murby and Dr. David Kram (Victorian College of the Arts) and the German-Australian Opera Grant adjudication panel (Ian Lowe - Melba Conservatorium, Peter Mander - Monash University, Merlyn Quaife - Melbourne University, Hans Henkell - Administrator) in cooperation with the Hessisches Staatstheater Wiesbaden represented by opera director Bodo Busse, offer the German-Australian Opera Grant. The aim of the grant is to promote emerging Australian opera singers, who are in the development stages of their professional career. More Than Opera Ltd is looking for additional support. Whilst the current grantee is already covered through generous donations we are now attempting to attract donations and sponsoring to finance the upcoming grant and further years. Donations to "More Than Opera Ltd - Gift Fund" are tax deductible. Copyright (c) 2003 - 2019 More Than Opera Ltd. All Right Reserved.